The weekend of Christie’s “Magnificent Jewels” auction preview in December coincided with a weekend my husband was out of town so the only way I could go was to bring my nine-year-old daughter with me. She doesn’t care too much about jewelry (yet) and she is a pretty good sport about these things—she also attended Lueur NY with me in October 2015—however, she only wants to see jewelry featuring animals. Luckily, this is never a problem! Loved the display out front. This was my very first visit to Christie’s and I’m so glad I had my daughter with me. She was very interested in serpent jewelry during the visit and she narrowed in on some good pieces, I have to say. She was like an old pro at this preview, writing down lot numbers of items she liked with a little red Christie’s pencil and paper. The lovely associates took things out of the case for her to see up close and also helped her try on one bangle she especially loved! These were my girl’s favorites. An Art Deco bracelet, circa 1935. This piece was her first request to see out of the case. 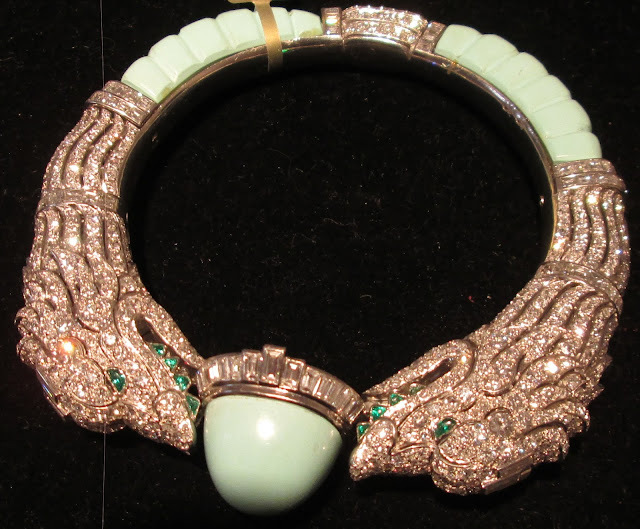 I thought this 1935 Art Deco bangle of diamonds, turquoise, and emeralds was stunning. The catalogue said it was a Dolphin-headed bangle but those heads certainly looked more like lions to me. A Bulgari Serpenti watch, circa 1960. It is always nice to visit with a Bulgari Serpenti watch. Two associates and I could not figure out how to open the head to see the watch face inside. I think we three were all worried about damaging that gorgeous pavé head! Oh well, one of these days I will see the inner workings one of these serpents. A 1970 Cartier snake bangle. My daughter also pointed out the 1970 Cartier snake bracelet above, of enamel, gold and diamonds, and asked me to take a picture of it. Later on when she was tired of looking at jewelry (outrageous, I know), she began to sketch this particular piece, based on this photo! This vintage snake bangle of enamel, diamonds, emeralds and a ruby accent was part of the online-only auction and was her particular favorite, so much so that she instantly named it “King Bubba” when it was clasped around her wrist. The Christie’s specialist and I had a good laugh over that one! My daughter’s eyes got very big when she heard that the estimate on the bangle was $4,000. The specialist and I then both encouraged her to study hard in school and get a great job in order to save up money to buy herself a similar snake bangle one day. Nothing like convincing the next generation of potential jewelry lovers to do it for themselves! My favorite of this line-up is the Art Deco bangle, with “King Bubba” a close second. Let me know which one you like best! Those were fun pieces! I took photos of the art deco and King Bubba bracelet too! I know you also saw some amazing sapphire earrings! Wink Wink. Is that story for another post?